IT HAS been an incredible couple of months for cosmetic doctor and Garrison native, Patrick Treacy. His recent run of good fortune started when he was runner-up in ‘Aesthetic Doctor of the Year UK and Ireland 2016’ event at The Grand Connaught Rooms in London in early July. Following on, Patrick was also rewarded by two peer recognition lecturing awards at the Kolkhida Congress Tbilisi, Georgia in mid-July and the ICC Congress in Cairo Egypt in early August. If this was not impressive enough, his prestigious Ailesbury Clinic in Dublin topped the poll and won an award for Best Clinic in Ireland. Patrick practices cosmetic medicine in his clinics in Dublin, Cork, London and the Middle East – it’s all a long way from his Garrison roots! “We just won ‘Best Cosmetic Clinic in Ireland 2016’ which is a recognition of something that was built from nothing and the dedication of one’s staff. “Now it is everywhere and I just returned from giving lectures in Cairo, Egypt and Tbilisi in Georgia, places that wouldn’t have been on our holiday destinations growing up. Next week I am lecturing in Moscow,” said Patrick. Patrick Treacy is best known for being Michael Jackson’s doctor but long before that the Garrison man started his career in biochemistry in Queen’s Belfast during the height of the Troubles, and once qualified he switched to study medicine in Dublin. 2016 has been a hugely successful year for the Garrison native as his career and business goes from strength to strength. Dr Treacy is now hoping to use his extensive knowledge to help those less fortunate. “I always have been motivated by a sense of humanitarianism. Despite Africa’s recent economic growth, little if any benefit has flowed down to the poor. 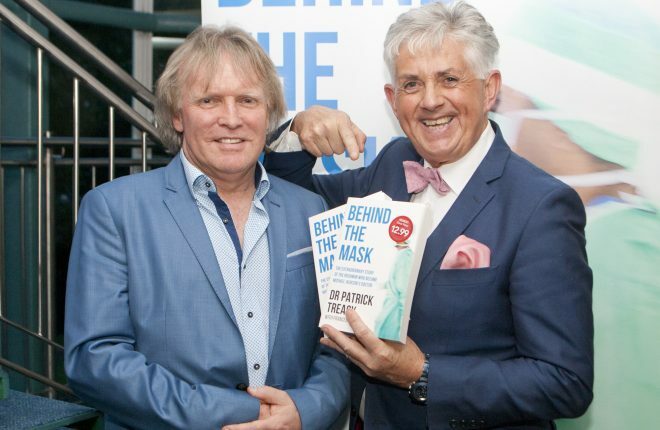 While balancing a busy clinic, Dr Treacy recently penned a best-selling novel ‘Behind the Mask’ detailing his life growing up in Garrison.